Did you know that we can assess the relative confidence of home sellers regarding Tallahassee Realtors? We measure the number of home sales in Tallahassee and look to see how many of these included a Realtor. Over time, the movement in this measurement gives us an idea of our local consumer confidence level. We can measure the total number of home sales (single family detached homes, condominiums, and townhouses) each month by looking to see what was recorded at the Leon County Property Appraiser's office. We can then measure the total number of homes sold in the Tallahassee MLS and then compare the two sets of data. Every transaction in the Tallahassee Board of Realtors' MLS included participation by a Realtor, whereas those not in the MLS typically did not have a Realtor involved (though sometimes we sell homes before entering them in the MLS, so there is a minor percentage of non-MLS home sales that were Realtor sales). 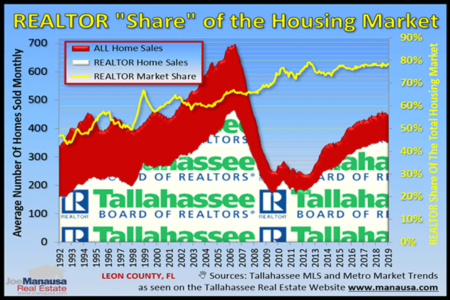 In the graph above, the red area shows the total number of homes sold in Tallahassee each month, while the area shaded with the Tallahassee Realtor logo shows the portion of those that were also reported in the Tallahassee MLS. Currently, 76% of all homes sold can be found in the Realtor MLS, thus we know that Realtors are involved in more than 3 of every 4 home sales in Tallahassee. We can also track the average production of Realtors in Tallahassee by comparing home sales to membership statistics. Unlike what many people think, Realtors in Tallahassee are not selling that many homes each when you average the whole group together (meaning make sure you hire an above-average Realtor when it's time for you to move!). The graph above measures the one year average of the total number of Realtors in Tallahassee in blue (measured on the left vertical axis) and compares it with the number of homes sold on average by each Realtor (shown in red and measured on the right vertical axis). As you can see, the average Realtor in Tallahassee sells about six homes per year, and this really has changed much over the past two years. The number of Realtors in Tallahassee is on the rise, as those who use the MLS is now approach 1,300 members. For those readers who are "math" oriented, you might be tempted to believe that 1,300 members x 6 sales each = 7,800 homes sold by Realtors. But this would actually be double the real number. Each home sold has two "sides," a buyer side and a seller side. So when THIS HOUSE IN SUMMERBROOKE is sold, there will be a Realtor working with the Seller, and one working with the Buyer. Thus, we understand that the current rate of Realtor sales in Tallahassee is closer to 3,600 homes (325 home sales per month). 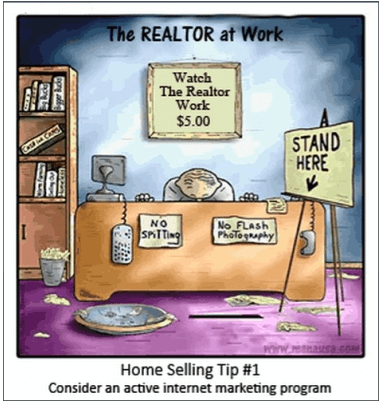 More home sellers are hiring a Realtor today. Is it due to the growing complexity of the home sales contract or the requirement to have an excellent digital marketing plan to sell a home? Either way, home sellers are hiring Realtors. But the average Realtor is only selling six homes per year. This is "part-time" results at best. The real take-away from this report is that the average Realtor is sporting a very low workload. 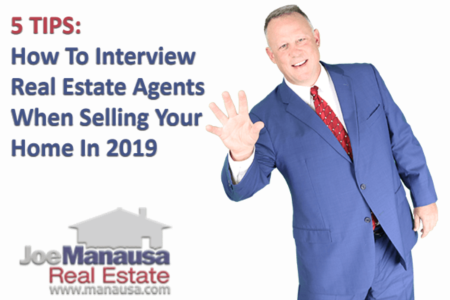 Take the time to interview mutliple real estate agents before you make a selection or you will likely encounter "average" results when selling your several-hundred-thousand-dollar home.